We found the water damage under the kitchen cabinet by accident. While sliding the slide-out in or out, we found it stuck or hung up on something. We found an errant can of Lima Beans that had found its way between the slide and the wall. The floor underneath was very soft. It caused a small (1/4 inch) gap between the kitchen outside wall and the kitchen cabinet. That gap created a lot of excitement and trepidation in our household! Evidently, our last trip was a bit rougher than we realized and things flew out of the cabinets and across the floor. We inspected the area and found that under the sink, a small drip from the facet and perhaps the counter are had slowly been finding its way down past the hot water tank and flowed toward the refrigerator. Thank goodness, it did not make it that far. We thought that we had some major damage and perhaps ruined all of our dreams. We now use the small bungee cords with balls on the end to secure doors while driving down the road, anywhere. We also check under both sinks for any sign of moisture at set up and close up when camping. We first called the manufacturer, then the dealership to schedule repairs but the wait time was not workable on our time schedule. We really can’t wait several months for a repair. Our goal was to get it repaired as quickly as possible so not to delay our plans of getting on the road full-time as soon as possible. We hired a professional RV Technician (who happen to purchase an item that we had on Craig’s List when we were downsizing our possessions) to evaluate and repair the water damage. 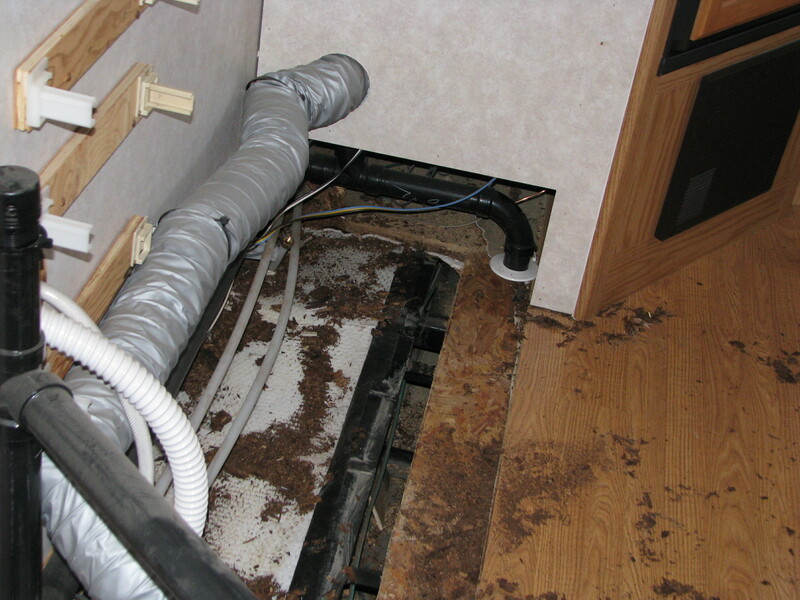 This appears to a long-term damage possibly from the faucet, plumbing and hot water tank and perhaps the area above the wheels under the RV carriage. There was no standing water or mold present, just crumbly wood where good dry wood once was. Phil pulled out the kitchen lower drawers, cabinets, sink, and stove, then Tim removed the final screws holding the hot water tank secure. We found the area under the hot water tank to be soft and completely deteriorated. Fortunately the water damage was not extensive but localized under the kitchen cabinet and not into the walls or slide-outs. Tim cut out the damaged areas, will be replacing the old with new wood, vapor barriers and then we start the re-install. It should only take a few days to complete. We have purchased new faucets (from Lowe’s) for the kitchen and bath, Phil will install them after he gets the kitchen back into place. We chose a faucet that has a sprayer on the base. It requires no modification of our sink. We assumed that since the kitchen and bath faucets matched that it might be a good idea to replace the faucet in the bath at the same time. They were not expensive, but should service us well. We also ordered a Oxigenetic shower head in the shower to increase the ability to rinse the shampoo out of my hair. We asked Tim to retrofit an electric fireplace for cool nights in the mountains. He researched which system will work best for us and installed it, adding a matching trim. He is also checking out the roof and looking for any issues that we can deal with now rather than on the road later. Our first major repair saga is now over and resolved properly. Fine Job, Phil and Tim!